Note: Click each photo in review for HD screenshot. When a theatrical playwright makes the transition to scripting for the big screen, sometimes they run into issues while trying to shake off their inherent stage presence when crafting their scenarios, where conversations might come across as too formalized or dramatic advances feel too histrionic. Such isn't a struggle suffered by David Mamet, who, even in his earliest cinematic outings, has actually used those theatrical nuances to his advantage, accentuating characters and geographical that bolster both suspense and the impact of action. 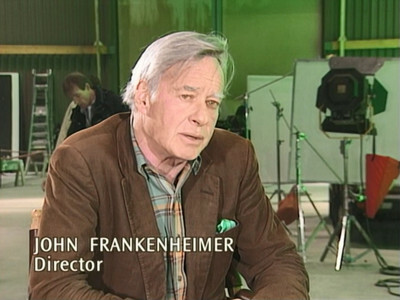 Mamet's name might not show up on the credits for Ronin, an international thriller directed by John Frankenheimer from a story originally conceived by J.D. Zeik, but the attributes of the script penned by pseudonym "Richard Weisz" deftly interweaves the decipherable features of stage-play writing with the moving parts of globetrotting espionage. It's the attention paid to the richly-drawn characters embroiled in the suspense -- and some gripping car chase sequences -- that elevates this classic, relatively standard crime-drama excursion. Ronin begins by offering a description of what's entailed by the film's title, fleshing out the meaning of the Japanese word as it relates to the samurai of history whom were released from their service for one reason or another, becoming without a master and, therefore, without a path to follow. 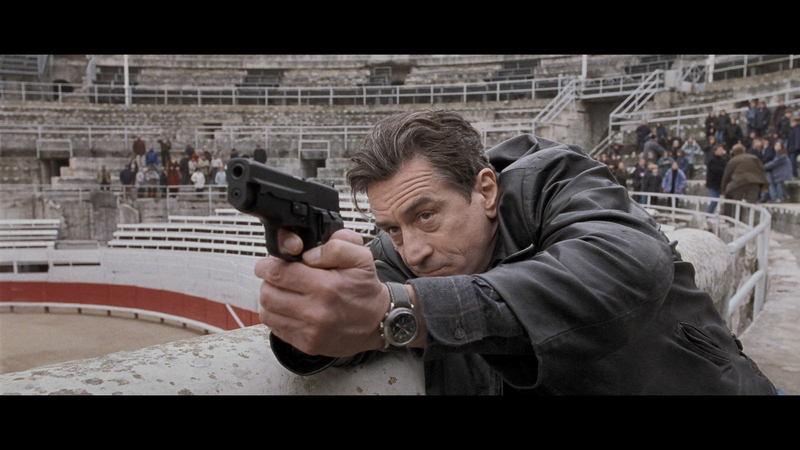 Cut to modern-day ‘90s France, where the camera focuses on what's assumed to be a contemporary version of a ronin, Sam (Robert De Niro), an ex-CIA operative who's gathered together with a collection of other qualified rogues -- a procurements expert (Jean Reno), a computer and tracking whiz (Stellan Skarsgard), an ex-military mercenary (Sean Bean), others -- recruited by an Irish woman (Natascha Mcelhone) for a delicate robbery. Their objective: to acquire a mysterious silver case, one wanted by both the Irish and the Russians. Their search takes them to points across France as the hunt for the silver case becomes more complicated, both due to the movement of the target and the evolving problems within this team of potential ronin. much in the action or suspense-building department, but it bears mentioning because it's an early example of how shrewd and dedicated the script can be with emphasizing smaller actions taken by the characters, fleshing out both their awareness and, in other circumstances, their recklessness. Staginess emerges in Mamet's conversations, especially when the entire crew gathers around tables and chart boards for logistical discussions, yet, coupled with Frankenheimer's conscious direction, this also draws the focus upon his impeccably distinctive characters: their strengths, suspicions, and likelihood of human error. 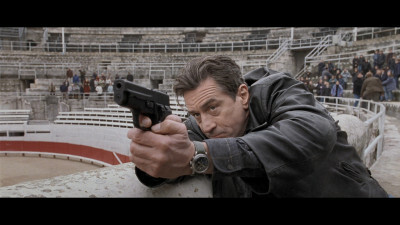 Despite speeding between French locations and showcasing more than a few gunfights with rapid-fire artillery, Ronin doesn't aspire to the grandness of blockbuster filmmaking, keeping the action tight and genuine with an energy not unlike Frankenheimer's work in Manchurian Candidate or Black Sunday. The activity gets its drive from the characters so articulately crafted early on, revolving around a compelling fluctuation in personality types, from a nervous paramilitary man who overplays his capabilities to the sneaky individual who deliberately underplays his hand and conceals what he can really do. Sam serves as a cipher to their mannerisms, as De Niro fleshes out the ex-government agent's savvy and perceptive grasp on the situation with intermittent glimpses at his personality's compassion and pragmatism in the process. His awareness comes through in scenes where he analyzes and responds to his surroundings, and attention naturally gravitates toward how Sam flexes his memory muscle to swerve out of situations; even a quick, one-and-done conversation with a guy about triangulating a cell phone has a somber, eloquent feel to it. the script's strategic placement of devices and diversions in the leadup to a conceivable heist. 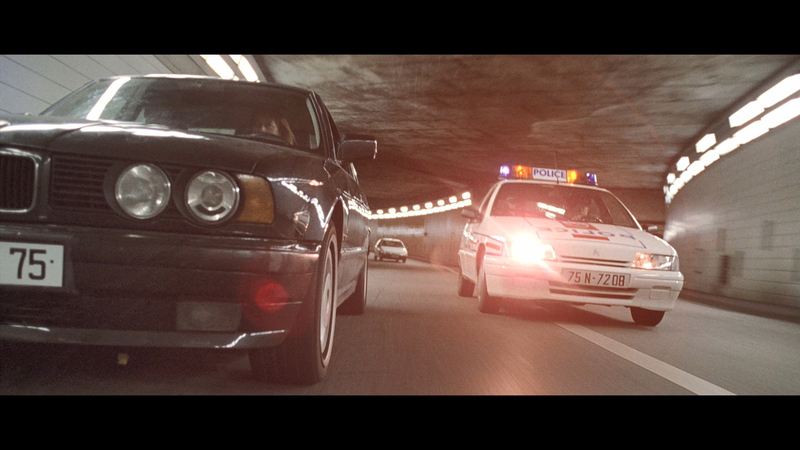 Exhilarating car chases through the streets of France are bolstered by involving, fitting jazzy type of scoring, while close-quartered, unpretentious yet playful gunfights are elevated by the story's willingness to keep allegiances and motivations in a state of obscurity. None of this tends to be outrageous by modern blockbuster standards, but they pack just the right firepower to come across as credible, effortless extensions of what's happened beforehand. Had the contents of the case been elaborated on, that very well could've distracted from the reserved virtues of what makes the crew's maneuvers and objectives so engaging. Ronin's a lengthy pursuit of a movie, though, with abundant twists and turns that continuously loop around one another in creation of a thorny situation for everyone involved. Mamet's script backs the hunt for the silver case into a dire corner that's tough to get out of without a little divine intervention, which results in some messiness near the end when the story needs to start wrapping up, relying on conveniently-placed visual cues pointing the crew in the right directions and improbable placement of old acquaintances to enable that movement and provide information. 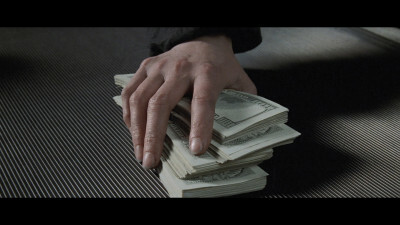 The longevity of the interest level in the people involved, especially the procedural revelations about Sam's back history and his place as a "ronin", are ultimately what sustains the film's vigor until its cathartic, yet still open-ended final scenes, allowing the suspense to convincingly deescalate and come full-circle. Despite not having his name formally attached to it, and despite a wobbly skid across the finish line, Ronin remains one of David Mamet's sharper unions of forward-moving thrills and play-caliber nuance of characterization. 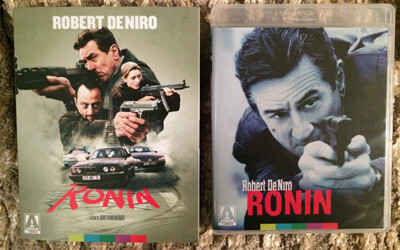 Arrow Video have snatched up Ronin to re-release on home video, this time encased in a thorough, well-designed package from the boutique label. Slick new artwork adorns a slightly matte-material slipcase, while the thicker, UK-style clear case gives the interior a familiar presence, which also sports reversible artwork. A Booklet includes production credits for the release and an essay, "Full Throttle Fin de Siecle" by Travis Crawford. Ronin's initial high-definition release from MGM received mixed marks, at best, suffering the pitfalls of a dated master with its blunt skin tones, cumbersome black levels, and a generally flat and digital presence … and that was eight years ago. A new master absolutely needed to be struck, and Arrow Video have done so with a new 35mm scan and restoration exclusively for this release, which amounts to a splendid, if not quite flawless 2.35:1-framed, 1080p AVC transfer that, even if it wasn't a difficult task, blows the previous Blu-ray out of the water. Flesh tones are organically warm yet responsive to the intended lighting and color timing of sequences. The contrast levels yield dark black levels, yet they constantly preserve underlying details and always enhance the depth of the image. What's more, the detail in the image can be quite impressive, where the textile of a leather jacket and a weave shirt, the coarseness of a stone wall, and the contours of eyeglasses and firearms are smooth and sharp. Film grain creeps into digital heaviness from time to time, though, while some noise pops up in certain scenes' black levels and, admittedly, other scenes simply don't display much depth to ‘em. Other than that, however, this is a stark improvement and worthy of the film. There's a lot of dynamic, varied action that goes on in Ronin, from tight-quartered gunfights to sprawling car chases, which engage a broad surround design that sprawls across the channels delivers more than a few deep punches throughout. The 5.1 DTS-HD Master Audio track is more than up to the task, though. The screeching of wheels during chases hits tight, clean upper-end responses and engages the front channels with effortless separation, scaling to the rear end of the surround stage frequently and vigorously. When there's a collision or a skid or the right pitch of a revving engine, the track's there to bolster it with the full intensity of the recording, possessing a natural ‘90s twang and restraint to it. There's plenty of gunfire, but there's also a few instances of big, explosive artillery, and both sides test the limits of the track's higher-end piercing and lower-end oomph. Dialogue is adaptive and coherent throughout, whether it's whispered irritation or full-throated arguments, and the slick musical score commands a thorough but self-aware presence across the surround stage, boasting admirable clarity but also restraint. Only one new extra has been minted for Ronin, that being a new interview with cinematographer Robert Fraisse, Close-Up (31:27, 16x9 HD), which first delves into the full scope of his career instead of just concentrating on his time with Ronin and Frankenheimer. Complimented with archival photos, he offers a concise depiction of his back-history to the point when Ronin was made, which is covered in the second half of the interview and tackles lighting, camera placement, and the ways he worked around Frankenheimer's creative process. This pairs well with the Audio Commentary by John Frankenheimer, the one that has been available on numerous home-video releases, in which he delves into the craftsmanship and perceived realism behind the film's creation. The other "new" feature comes in a roughly half-hour general spotlight piece on Robert De Niro from Cinefile, entitled You Talkin' To Me? (27:01, 4x3 HD), featuring Quentin Tarantino leading the discussion in a period way, way early in his career ('94; he's credited as "Director ‘Reservoir Dogs'"). The rest of the special features serves as a completionist catchall for the previous releases' individual supplemental materials, most filed under the "Archival Features" tab on the disc. 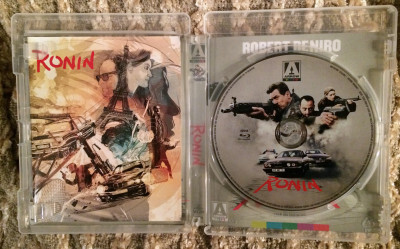 They include Ronin: Filming in the Fast Lane (17:45, 4x3), a fairly standard overview-style press collage of interviews with Frankenheimer and the cast; Through the Lens (17:47, 4x3), which specifically centers on Robert Fraisse‘s photographic imprint on the film; The Driving of Ronin (15:29, 4x3), in which coordinator Jean-Claude Lagniez tackles the elements of stunt driving and navigating 100+ mph speeds through Paris; the self-descriptive Natascha Mcelhone: An Actor's Process (13:57, 4x3); Composing the Ronin Score (11:52, 16x9), which offers a portrait of Elia Cmiral's history and his guidelines for scoring the film; In the Cutting Room (18:56, 4x3), a lengthy glimpse at Tony Gibbs' method behind editing the film's dialogue and action alongside its "crisp" and "American" slant; and a series of Venice Film Festival Interviews (20:41, 4x3) that can be found among the other extras. Arrow Video have also made sure to port over the Alternate Ending (1:49, 4x3 Letterbox) -- which, while similar in construction, adds different tones and intentions based on who's visible in the sequence -- as well as a photo Gallery and a Theatrical Trailer (2:28, 16x9 HD). 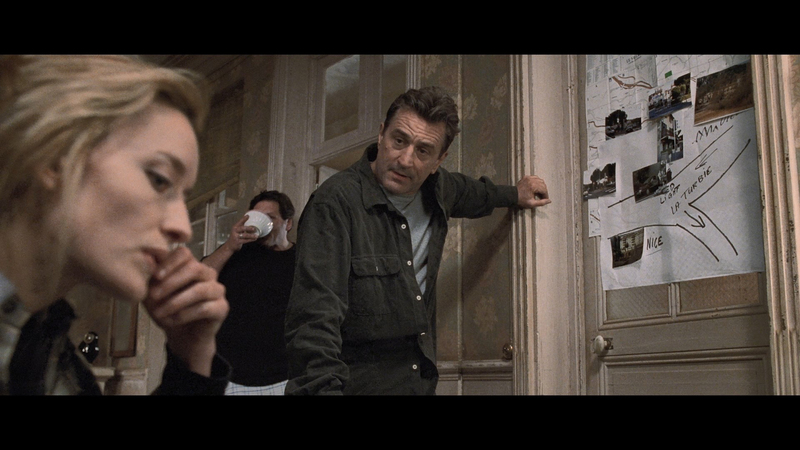 Classic yet well-drawn and surprising roguish characters are the driving force behind Ronin, whom are given polished dialogue and clever, sensibly flawed responses to an espionage heist orchestrated -- and gone awry -- in France. The thrills themselves aren't the most novel or surprising one can find of the genre, but the ways in which these specific characters conduct themselves through the familiar surveillance, planning, and heist itself result in absorbing character-driven suspense. Include a composed, subtly charismatic Robert De Niro and exceptional car-chase filmmaking, and you've got a fine embodiment of the genre that's elevated by both John Frankenheimer's adaptive direction and the articulate nature of David Mamet's versatile writing. Arrow's Blu-ray looks and sound up to snuff, and the collection of extras offers a bounty of material worth sifting through. Highly Recommended.